Commercial fisheries occur for three species of jack mackerel: Greenback horse mackerel (Trachurus declivis), Yellowtail horse mackerel (T. novaezelandia), and Chilean jack mackerel (T. murphyi). However, commercial catches and management of jack mackerel are not reported separately by species. The high harvest volume makes jack mackerel a valuable part of New Zealand’s deepwater fisheries. A number of factors influence landing volumes in the jack mackerel fisheries including availability of annual catch entitlement for bycatch and changes in market price. All species of mackerel can be caught by bottom trawl, mid-water trawl or by purse seine. Landings in JMA 7 represent the greatest proportion of total landings and are mainly taken by chartered trawlers. The jack mackerel in JMA 1 is mostly caught by purse seine in the Bay of Plenty and on the east Northland coast. Jack mackerel is often combined with kahawai in the purse seine fishery. In an effort to conserve the kahawai quota, fishing companies will avoid these mixed schools, particularly at the start of the fishing season. Blue mackerel and skipjack tuna are fished in preference to jack mackerel in the purse seine fishery, causing the length of the jack mackerel season to be influenced by the availability of these species. Jack mackerels have been included in the Quota Management System (QMS) since 1996. Before 1996, jack mackerels were considered part of the QMS, although ITQs were issued only in JMA 7. Jack mackerel in JMA7 is managed as part of New Zealand’s deepwater fisheries. 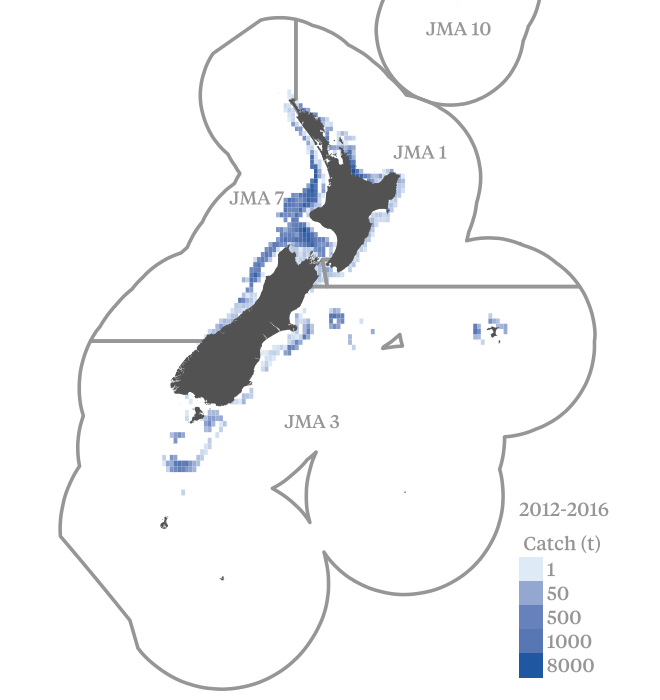 JMA 1 is managed by the Inshore Fisheries Management Team as almost all catch of those species in this area is taken by the domestic purse seine fleet. 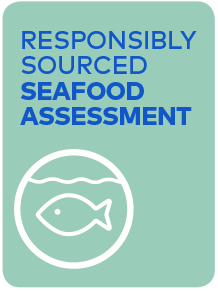 The risk assessment covers roughly 90% of all jack mackerel caught in New Zealand. Commercial catches and management of jack mackerel are not reported separately by species. This is complicated by the fact that the stock structure of the three jack mackerel species is uncertain, and the Quota Management Areas may not reflect distinct biological stocks. Although many of the systems and tools comprising an effective harvest strategy are in place, stock status is unknown and there is no reliable index of abundance. The Ministry for Primary Industries concluded that it is not known whether catches at the level of the current Total Allowable Commercial Catch (TACC) or recent catch levels are sustainable in the long-term. Very good information on fleet composition is available through the QMS arrangements and observer coverage, particularly in the JMA 7 region, has been relatively high in recent years. Harvests are closely monitored through the QMS reporting arrangements, with validation from observers. Estimates of illegal fishing are not available, but anecdotal evidence suggests it is insignificant. The main weakness of jack mackerel against this indicator is the absence of a reliable measure of stock abundance. Assessments, particularly for JMA 1, have been infrequent and it is not clear how they have actively supported the harvest control rule. Some trawl bycatch of jack mackerel has been reported in JMA 1. Several bycatch issues have been reported for the JMA 7 fishery. Blue mackerel is a large bycatch fishery that operates for several months of the year, and includes other bycatch species taken in this fishery such as barracouta, gurnard, John dory, kingfish, and snapper. For the JMA 1 purse seine fishery, impacts on main other species are limited. For the JM A7 fishery, these measures form at least a partial strategy which is expected to maintain JMA 7 at levels highly likely to be above the point of recruitment impairment. The results of independent research sampling and periodic stock assessments on main other species provide an objective basis for confidence that the strategy will work. The main potential endangered, threatened and protected species interactions in the jack mackerel fisheries are with seabirds and some marine mammals. The available evidence indicates it is highly unlikely the trawls involving jack mackerel will hinder recovery of seabird species. In the most recent assessment, only one species of seabird, black petrel, had a median risk ratio higher than 1 (or upper 95% confidence limit higher than 2). There have been no observations of black petrel captures in jack mackerel trawl fisheries. For other species, the current level of interactions in the jack mackerel fisheries appears highly unlikely to hinder recovery. It appears highly unlikely that the level of incidental captures of New Zealand fur seals in the jack mackerel trawl fisheries are hindering recovery. Given the uncertainty around setnet and inshore trawl fishery mortalities, cumulative fisheries risk for common dolphins remains highly uncertain in the pelagic jack mackerel trawl fisheries. The final results from the New Zealand Marine Mammal Risk Assessment are expected in 2017 and future scoring should take these into account. While objectives broadly consistent with Components 1 and 2 are specified in the Act and Fisheries 2030, and are therefore implicit in the fishery specific management system, it is not clear that explicit short and long-term objectives for inshore jack mackerel fisheries are in place at this stage. On the other hand, the management system for deepwater jack mackerel fisheries has explicit short and long-term objectives which are set out in long-term plans e.g., Fisheries 2030, National Deepwater Fisheries Plan and Annual Operational Plans. Objectives are subject to an annual review report and are explicit within the fishery’s management system. Stock assessments for jack mackerel are complicated by the reporting and management of three species under a single code. The stock structure of the three jack mackerel species is uncertain and further complicated with the effect of the relatively recent (1987) invasion of murphyi on stocks of the New Zealand jack mackerel. The most recent assessment of JMA7 indicated that overfishing was unlikely to be occurring, although the position of the stock against reference points is unknown. A stock assessment is planned for 2017-18. The JMA7 fishery has a bycatch of common dolphins. Preliminary risk assessment results examining cumulative risk to common dolphins across all New Zealand fisheries are highly uncertain with an estimated risk score that may be less than half the Population Sustainability Threshold or may exceed the Threshold by a factor of two. Final risk assessment results are expected in 2017. Target species (JMA1_PS) - Uncertain: Uncertain stock status; no recent stock assessment. Target species (JMA7_Trawl) - Uncertain: Stock assessment planned for the 2017/18 financial year. Bycatch and ecosystems (JMA1_PS) - Stable: No major changes to existing bycatch and ecosystem arrangements are expected. Bycatch and ecosystems (JMA7_Trawl) - Uncertain: Final outcomes of the Marine Mammal Risk Assessment are expected in 2017.